April 1st, 2012 marks the start of the 2nd annual Portland Photo Month. A time when the city is buzzing with all genres of photography in many of Portland’s finest gallery spaces. I conducted a question/answer interview with Laura Moya, Director of Photolucida who in large part helps organize this extravaganza! Please read on to learn more about this important celebration of Portlands photography. Who came up with the idea for P.P.M? “Portland Photo Month” came up as the moniker last spring for the celebration of photography that surrounds Photolucida Portfolio Reviews Festival, which happens every other April. The festival is four days long, and we have 160 photographers and 60 Reviewers (curators, festival directors, publishers, gallerists) that fly in from all over the world. It seemed logical to give the events and exhibits a formalized name and a foundational beginning, the object being to make it an event that more of the general public can participate in. Even though Photolucida’s Reviews happen every other year, our intent is to have every April known as “Portland Photo Month”. I believe Laura Russell of 23 Sandy suggested the actual name. How did you go about organizing it, how much help do you get from others? Folks associated with various photo organizations around town (Photolucida, Newspace Center for Photography, Blue Sky, Portland Art Museum and the Photo Council, Portland Art Dealers Association) had a few get-togethers and did some brainstorming. “Portland Photo Month” is intended to be a collaborative effort between organizations whose mission it is to celebrate the culture of photography. Photolucida oversees the “Portland Photo Month” website, but our intent is not to be the sole organizers. Hopefully, as things progress, many organizations will jump firmly on the bandwagon and carry the idea forward. Ideally, who do you want to participate in P.P.M? Any organization or business that would like to promote the culture of photography through an event or exhibition is welcome to participate! People can absorb photography equally well in a coffee shop or in a wing of a museum – as well as anywhere in between. A primary goal of Portland Photo Month is to get more of the “general public” involved in thinking about photography. Portland is a hotbed of great festivals, from Wordstock to MusicFest NW – and we would like to see the public explore the idea of photography as an art form by just getting out and about. There are a lot of events on the roster for this P.P.M, are there any in particular you think everyone should know about? People should just go check out what looks interesting to them – aesthetically, the work runs the gamut, there is something for everyone! I can talk about a few things that are interesting on a personal level – first, I am truly excited to have Chris McCaw hop up to Portland from San Francisco to give a talk and demonstration on Sunday, April 22nd. I first met Chris and saw his work in 2007 and was fascinated by his SUNBURN series – he works with handmade giant-format cameras using super long exposures to produce images where the actual light emanating from the sun burns a trail in the photographic paper. One of his pieces is a recent acquisition for the Portland Art Museum. It is a treat to have him here. A interesting show to check out might be Contents: Love, Anxiety, Happiness & Everything Else, which is curated by Darius Himes and will be up at Newspace. Interesting because it will be a prime example of what “emerging” means in the world of contemporary photography. There is always a debate on what “emerging” means exactly in this context, and some answers might be found here! The fifty pieces in this show were chosen out of over 700 entries in Critical Mass 2011 (one of Photolucida’s programs) and voted to the top by 200 photo curators, editors, publishers, gallerists, etc. from around the world. Check out the show in the gallery at Newspace Center for Photography, located at 1632 SE 10th Ave. Portland, OR 97214. I think Jim Lommasson’s What We Carried: Fragments from the Cradle of Civilization project is an important one, and encourage people to see it. Lommasson has photographed and interviewed Iraqi refugees and immigrants who have fled to the U.S. since 2000, and documented their personal items that have survived the journey. He then asked the participants to write about their objects directly on the finished photographs. I have been curious about this series, and know it will break my heart, as it should everyone’s. In the same vein, Nigel Dickinson’s show Smoky Mountain Rubbish Dump, Phnom Penh, which will be up at Blue Sky, is sure to be powerful. Both Lommasson and Dickinson somehow make beautiful imagery out of more-than-horrific societal situations, which does not come easily or happen often. Lommasson’s show; Mar 15 – Apr 14, 2012. Mon – Sat, 10am-4pm (Closed Sundays) 17677 NW Springville Road – PCC/Rock Creek Campus. Or at http://www.lommassonpictures.com/. LightBox Photographic Gallery in Astoria is hosting their PDX Photo Month Exhibit in appreciation of/showcasing work from the Portland Photographic Community, I think it will be a great representational show of all the stellar talent that Portland houses. The reception for the exhibiting artists is Saturday, April 14th. Photolucida is doing a project for Portland Photo Month – THEN.HERE.NOW. – can you describe what it is? Photolucida wanted to take the photography viewing experience outside of a gallery or book environment. We wanted to involve the Portland “public”, both in the submission process and in the viewing process. We opened submissions to anyone – pro, amateur – the only rule being that one had to have made the images in or around Portland. These contemporary images will be juxtaposed with historical imagery (of Portland and it’s people) from individuals and organizations. We wanted to use photography as a medium/tool to help us explore who and where we are, right now, in Portland, Oregon. Photographer/publisher Raymond Meeks agreed to curate a slideshow from the submissions. 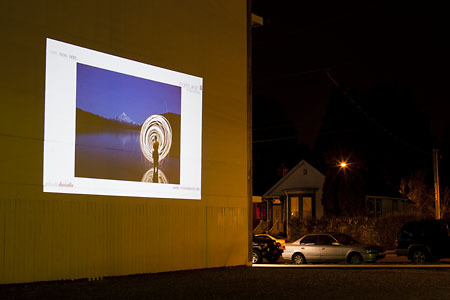 The slideshow will be projected live in four outside locations around Portland during April, in the viewing window at Blue Sky gallery, and on the website itself. Check the THN website for locations shortly and join us on a sidewalk near you in April! Just about everything you need to know about Portland Photo Month 2012.